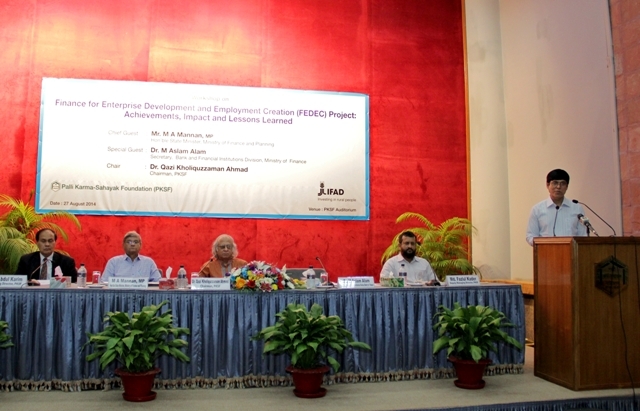 The closing workshop of Finance for Enterprise Development and Employment Creation (FEDEC) project was held on 27 August 2014 in PKSF Auditorium, Agargaon, Dhaka. This workshop was arranged to share the achievements, impact and lessons learned from the recently completed (31st March 2014) project, implemented by PKSF. The honorable State Minister, Ministry of Finance and Planning, The Government of the People’s Republic of Bangladesh, Mr. M A Mannan, MP was the Chief Guest in the workshop and the Secretary, Bank and Financial Institutions Division, Ministry of Finance, Dr. M Aslam Alam attended the workshop as Special Guest. Dr. Qazi Kholiquzzaman Ahmad, Chairman, PKSF presided over the workshop. Mr. Md. Abdul Karim, Managing Director, PKSF gave valuable speech in the workshop. Mr. Fazlul Kader, Deputy Managing Director, PKSF was also present in the occasion. The workshop was attended by around 400 officials of PKSF, POs, Government and other organizations. 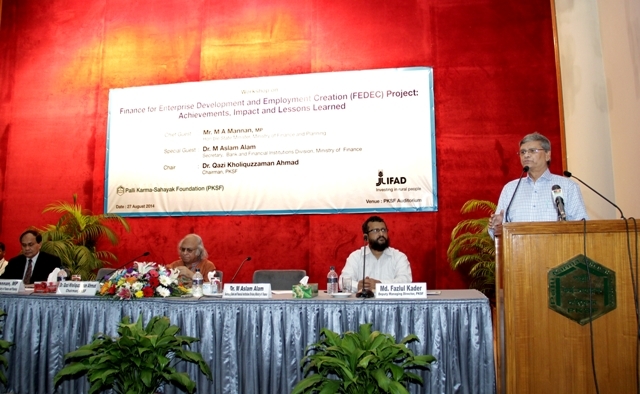 An Independent Consultant, Mr. Mahbubul Islam Khan, gave a presentation on “FEDEC Project: Achievements, Impact and Lessons learned” at the beginning of the workshop. In his presentation, Mr. Khan described the FEDEC’s success and impact in expanding MEs. He concluded his presentation mentioning that lessons learned from the project can be useful for any initiatives for developing ME sector in future. With different interventions of the FEDEC project, microenterprises of the project participants have expanded remarkably and created wage employment for about 3.51lac people in last five years. POs of PKSF disbursed around 15,500 crore taka to entrepreneurs during the project period. Around 6 lac microentrepreneurs throughout the country received financial and technical supports from the project. Participants from the Partner Organizations (POs) also shared their experiences in implementing the project at field level. They mentioned that Value Chain Development Supports in combination with financial services made the project a grand success. Mr. Nicolas Syed, Country Program Officer of IFAD thanked PKSF for implementing the project successfully. IFAD will continue its support, he hoped. Mentioning the background of introduction of PKSF’s Microenterprise Program, Mr. Fazlul Kader, Deputy Managing Director of PKSF stated that Microenterprise Program expanded manifold with the help of FEDEC Projcet. FEDEC project can be treated as the milestone in the development endeavor of PKSF in expanding ME sector. Managing Director of PKSF Mr. Md. Abdul Karim gave a short description of Project activities and expressed his satisfaction on successful completion of FEDEC project. The Managing Director mentioned that one of the PKSF projects funded by IFAD titled ‘Microfinance for Marginal and Small Farmers (MFMSF) Project’ has achieved Development Impact Honors Award from the US Department of the Treasury. FEDEC project has also created an excellent example of high quality project implementation. Dr. Qazi Kholiquzzaman Ahmad, Chairman, PKSF mentioned that, through this project, PKSF for the first time implemented various sub-sector development activities following Business Cluster Approach. Training and other technical supports along with financial services can be more effective in reducing poverty sustainably. FEDEC project is an example of perfect combination of technical assistance with financial services. He also mentioned that PKSF has identified around one thousand business clusters throughout the country, on the basis of which, it will take more sub-sector development activities in future with the core objective of laying a sustainable foundation for Microenterprise based rural industries. The Secretary of Bank and Financial Institutions Division, Ministry of Finance also appreciated FEDEC’s success. He said more rigorous data collection and analysis would highlight the excellent outcome of the project. Honorable State Minister in his speech praised PKSF and its Partner Organization for successfully implementing the FEDEC project. He opined that FEDEC project was very successful in achieving equity and growth together, which is very important to expedite poverty alleviation. 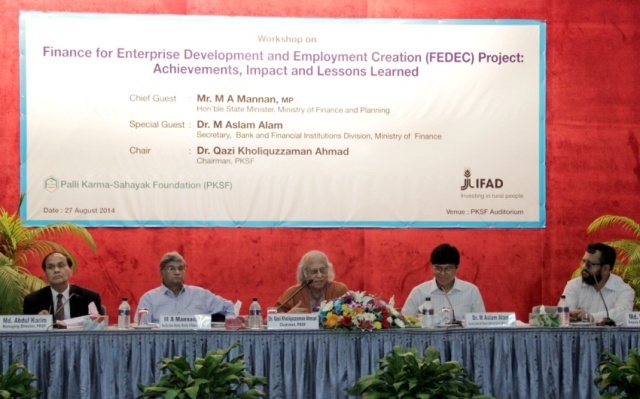 The success of FEDEC project bears a clear indication that Bangladesh is in the right track in reaching the target to become a middle-income country. The International Fund for Agricultural Development (IFAD) will continue its supports to implement this type of development activities in Bangladesh, he expected.